The Oklahoma City Thunder’s 16-point thrashing of the Miami Heat is exactly what Head Coach Billy Donovan wants to see in February. The shortest month of the year is also among the busiest. Between motion picture awards season, the Superbowl, and a nascent congressional term, attentions are easily divided. And with NBA All-Star Weekend around the corner, being able to coach the Thunder to their 33rd win in 51 games over a team capable of surprising even the strongest NBA powerhouses is something to be proud of. (Yes, Miami has surprised at least a couple good teams this season). 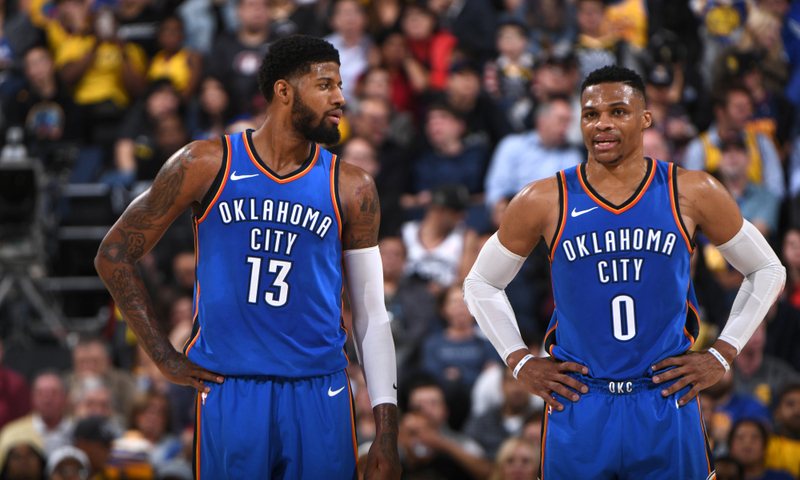 Following that win and the Golden State Warrior’s loss to the Philadelphia 76ers, the Thunder became the owners of the longest active win streak. Seven straight wins (which was quickly broken by the Boston Celtics on Sunday), including three against the Sixers, Portland Trail Blazers and Milwaukee Bucks might seem inconsequential, but the circumstances around them highlight the team’s efforts. As attention spans start to wane and focal points shift onto the All-Star break, only the toughest teams can appropriately endure the slog of the new year. Compounding the tiring nature of the race to All-Star Weekend is the news that Thunder forward and defensive maestro Andre Roberson is still far from his return. Despite this, the Thunder are 10-6 since the ball dropped in Times Square, and are applying pressure to their opponents in ways they hadn’t earlier this year. OKC’s 3-point shooting is at a season-high since the new year at 41.2 percent, up from 32 percent through the start of the season. Terrance Ferguson is a huge part of the improvement. His current mark of nearly 49 percent is bolstered by four of the last seven games in which he connected on at least half of his 3-point attempts. The team’s role players have also been helping the Thunder legitimize their inevitable playoff run. Dennis Schroder is morphing into his most productive NBA self, posting 15 points per game off the bench while strengthening his Sixth Man of the Year candidacy. Jerami Grant is shaping up to be a primo presence in the paint who delivers soul crushing dunks nightly. And of course, there is Steven Adams, the immovable Kiwi wall whose post footwork is almost unmatched at his position. But biggest star in Oklahoma City’s latest run has been the synergy between Russell Westbrook and Paul George. After faltering in the 2018 NBA Playoffs, Westbrook and George have amicably pushed their partnership. The biggest changes came offensively, as Russell Westbrook is logging his lowest usage percentage since his sophomore season. Westbrook has by no means taken a back seat—he’s well on his way to his third consecutive season averaging a triple double. But having George, a sharpshooting wing who has only broken the 30 percent usage rate barrier once in his career, has allowed both to enjoy a give and take on the offensive end. Against the Miami Heat on Friday, Westbrook attempted a single 3-pointer, a feat he has accomplished just five other times this season. George picked up the slack, nailing 10-of-16 en route to the victory. Instead, WB spent the night weaseling through the paint to finish at the rim. He even turned down an open 3 for a more comfortable mid-range look. Figuring out how to best share the offensive load has depressurized OKC’s other contributors. A 43-point night for George might not be the norm—though he is having a career year in terms of points per game at 27.6—but takes the weight off of Patrick Patterson and Nerlens Noel from having to stimulate the offense from the bench. George acknowledged the new-look offense earlier this season. Speaking with ESPN he noted that playing to his strengths, without having to be the only offensive cog, has helped his game blossom. “I think just the experience and not having to shoulder everything offensively, it’s definitely helped as well. But I do feel I’ve grown, and just been seasoned, just knowing how to attack, how to play off certain defenses,” George told ESPN. Westbrook has also relished the paradigm shift. In addition to celebrating his fellow All-Star’s success, he’s been free to improve defensively. Currently averaging 2.3 steals per contest, this season has seen Westbrook’s defensive improvements litter the box score more than ever before. Habitually a gambler on defense, especially in crucial moments, Westbrook has made a point not to jeopardize the rest of the team’s defensive cohesion. Fronting opponents he knows he can beat creates transition opportunities for his teammates that, once upon a time, formerly saw Westbrook charging to the rim solo. He’s also closing out opponents, sprinting from the top of the key to the corner to create disruptions. All of this adds up to a Thunder squad that has more tools to be competitive in the post season. Where Westbrook used to command the offense alone, he’s finding support in his number one option George and the rest of the herd. And where Andre Roberson was the defensive glue that held the team together, Westbrook’s smarter play is helping the entire team prosper. The Warriors, with their stacked starting five, are surely the favorites to take the title come June. But the focus created by George and Westbrook’s unity is raising Oklahoma City to new heights.